As motorcycle accident lawyers, we unfortunately see tragic accidents every day. Many of these accidents are caused by other people’s negligence, i.e., a car or truck driver who failed to pay attention to a motorcyclist on the road. Assume You Are Invisible! Most accidents result from this sad truth: people on the road simply don’t pay attention to motorcyclists. As a result, drivers rear-end us, turn left in front of us, or run us off the road. If you understand this reality, there are things you can do to ride defensively and avoid accidents. Specific techniques are discussed below. Be Noticed. Since most drivers don’t normally see us, we need to do everything we can to help them out. Always ride with your high-beams on during the day and wear brightly colored gear. Don’t complain that bright gear isn’t stylish — there are actually some pretty cool looking his-vis accessories these days. Don’t Ride in Blind Spots. This seems obvious, but many riders are content to ride alongside a car’s back wheel — right in the driver’s blind spot! This is the single most dangerous place to ride on the road — don’t do it. Try to ride in open zones of traffic behind or in front of other vehicles. If you must ride alongside cars, make sure you are in the driver’s line of sight. And vary your speed. Riding along with the flow can make you invisible to other drivers, especially in heavy traffic. Be Careful When Waiting At Stop Signs/Stop Lights. We see a lot of rear-end accidents that happen at stop signs or stop lights. A motorcyclist stops at the intersection, then gets slammed from behind by a car. To avoid this, position your bike to the side of cars or between lanes (i.e., lane split) so you are protected from cars driving up behind you. Note: lane-splitting down the highway is an entirely different matter. Read more about that here, here and here. Traffic slowing? Stay left (or right) Along the same lines, when traffic slows suddenly, stay to the left or right of the car in front of you. This will give you an escape route if needed. It will also help keep you from becoming a hood ornament if the car behind you fails to stop in time. Once you’ve stopped, be ready–clutch in, your bike in gear and your eyes on the mirrors. You never know. Watch Out For Left Turning Cars. At least 50% of the accidents we see happen because some bonehead driver turned left in front of a motorcyclist. This usually results in a T-bone collision which sends the rider “Superman” style right over the handlebars. Don’t let this happen to you! Whenever you approach an intersection, make sure you are looking ahead for any cars in the left turn lane. Look at the driver’s head, hands and front wheels to see if they are going to turn in front of you. Be ready to hit the breaks, throttle, or to take evasive action if the car cuts you off. Let Other Cars/Trucks Run Interference. Following up on the point above: when going through intersections, let larger vehicles run interference for you, i.e., drive alongside a big vehicle as you go through the intersection. If some idiot is going to blow a red light, it’s much better for them to hit the cargo van driving next to you, right?? For the same reasons, don’t lunge through an intersection as soon as the light turns green. Be patient, and use the vehicles next to you as cover. Watch drivers’ heads and mirrors. Watching the head movements of drivers through their windows and mirrors is an excellent way to anticipate sudden moves. Most drivers won’t lunge left or right without first moving their heads one way or another (even if they don’t check their mirrors). Never get between a vehicle and an offramp. Drivers who decide to exit at the last minute kill many riders every year. The simple rule, then, is to never position yourself between a vehicle and an offramp. Passing on the right is generally a no-no, but in this day and age it’s sometimes necessary. So if you do it, do so between exits or cross-streets. Take a Safety Course! Take a qualified Motorcycle Training Course! These courses can provide excellent, hands-on tips to help you avoid accidents. There is a difference between reading tips on websites and getting hands-on instruction from a safety expert. Courses are relatively cheap. Take advantage of them. Wear Proper Equipment. 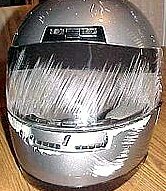 Last but not least: Always use proper safety equipment, including helmets!! We can’t even count the number of clients we’ve seen who would have been severely hurt or killed if they weren’t wearing a helmet. Think what this guys’ face would look like if he wasn’t wearing a helmet . . .
Motorcycle safety is more important than ever before. The number and rate of motorcyclist deaths on U.S. roads are rising dramatically. Motorcycle rider fatalities rose 115 percent between 1997 and 2005. During the same time, fatality numbers for passenger car crashes dropped. Statistics show that motorcyclists are about 34 times more likely than passenger car occupants to die in a motor vehicle traffic crash and 8 times more likely to be injured. 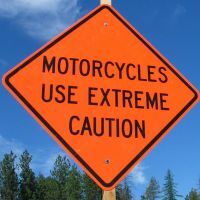 Click here for more motorcycle accident statistics. We are motorcycle accident attorneys, but first and foremost, we are motorcyclists. We are here for you in case of a motorcycle accident, but we’d rather see you on the road than in the courthouse! Defensive riding, motorcycle safety training, and proper equipment can reduce the odds you’ll need us. Have fun, but ride safe and ride smart.